An inquest has been opened and adjourned into the death of a toddler who died following a house fire on the anniversary of her brother's cot death. 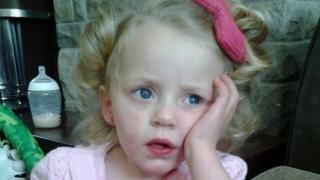 Three-year-old Angel Jade Keogh died after a blaze tore through her family home in Carmarthen on 15 June. Her mother Alice Smith, 24, who has now been discharged from hospital, described her daughter as a "beautiful princess". She said Angel would be in the family's hearts and memories forever. Events surrounding the toddler's death are being investigated including why an ambulance was unavailable to take her to hospital. The Welsh Ambulance Service said it was looking into the details surrounding the incident. The fire happened on the first anniversary of Angel's brother Jake's death. Neighbours called emergency services after spotting black smoke billowing from the house in Bryn Gorwel. Angel and her mother were rescued by firefighters, while the girl's father jumped from a window. She was taken to Glangwili Hospital by police officers but was later transferred to the University Hospital of Wales in Cardiff where she died. Dyfed-Powys Police said a file would be prepared for the coroner.